Techniques can be executed to give the audience something more than information. We react viscerally to the screen. The camera functions like the human eye – it sees, and it presents what is put in front of it to the spectator on the other side of the lens. Why is it that the lens the filmmaker uses, the angle we see the shot from, the rapidity of the edits, affect us in emotionally captivating ways some of the time, but other times leave us disengaged or unactivated? A lot of credit has to be given to what the camera sees – the performances of the actors, the power of the story and script all have an enormous impact on how we are affected. But, nonetheless, how the camera sees plays a decisive role to those materials. A big part of the effectiveness of the way these tools are deployed is the strategic use of objective and subjective perspectives. This can be a confusing concept to filmmakers when first introduced to it. An objective perspective is the use of cinema’s visual language just to convey information, as if from an outside point-of-view, with very little emotional emphasis of any character’s perspective. A subjective perspective uses the visual language of the scene to convey an emotional impact that grounds the scene in the mental or emotional ‘perspective’ of a particular character. Every decision could be screened through the question of whether or not you are injecting a subjective perspective or grounding the scene in an objective point of view. The camera begins with a Close Up (CU) on a young woman asleep in bed. It then pans left across the room, revealing another woman sitting smoking a cigarette in a Wide Shot (WS). The camera follows the second character as she stands, walks to the window and opens the curtains. The camera cuts back to the first character in bed as she sits up (CU). Then cuts to the same character looking through a window in the follow scene (CU). The use of the camera, the position, the lenses, the framing all contribute in subtle and not so subtle ways to the emotional vantage point within the scene. From an objective perspective, we observe the action from a distance. The camera may remain separate from the headspace of any of the participants in the scene. This tool can be used creatively to create dynamic, impactful storytelling. Scenes can begin in an objective perspective. A Medium Shot (MS) of two characters, Suzanne and her father. The camera expresses an emotional distance and puts us as the audience in an observational place. Then a beat happens. The camera frames Suzanne in an over-the-shoulder Close Up (CU). Followed by a reverse angle on her father. The scene has radically changed. We experience the emotions of the scene much more vividly and through the perspective of Suzanne. The subjective perspective is not a POV shot. These are two completely different things. A POV shot shows explicitly what the character sees. What is unique about the POV shot is that while it manages to convey information that is useful and impactful, it is actually quite alienating on its own. Not quite subjective or objective. When we are in a POV shot for a long period time, we find that we have no real insight into the mental or emotional perspective of the character whose eyes we are supposed to be seeing through. The loss of seeing the emotions of the character on screen through the visual language of the camera and the editing somehow distances us from the experience. Seeing through the eyes of a character in a POV shot is alienating. Films that use the POV throughout never manage to provide the audience with the same level of engagement with the characters that traditional cinema has sustained. The POV shot is useful for conveying emotions. But primarily where it is used in short intervals and juxtaposed with a good objective perspective shot. For example, in Vertigo, the POV shots function to give you information about what the character would be seeing. No matter what the scene is, there is a dimension of objective and subjective perspective always at play. While character perspective is a valid tool and is one way of analysing how the visual choices are working in any given scene, there are always other ways of looking at the same tools and choices that are available to the filmmaker. Many filmmakers choose to think purely in terms of visually exciting imagery and design their story to facilitate a kind of visual spectacle. Some filmmakers focus totally on the performances of the actors. The camera work and visual language is there only to facilitate the performance and does little to create perspective on the part of the characters in the scene. These choices are just as valid as a tool to create emotional perspective. Each filmmaker in each film establish their own rules for how visual language should work on the audience. Think of a film as an interior dialect within the larger language of film grammar. The role of the filmmaker is to determine how those rules will work and how they will interact with the story they are trying to tell. In an Ozu movie, the visual language will always obey strict rules – the camera will refuse to move, it will remain close to the ground, frames will always seek balance and harmony, a 50mm lens will often be employed. We might call these frames objective and observational. The impact of the moments when Ozu breaks his own rules and moves his camera are all the more intensely felt because of the austerity upon which he has built his cinema on. If your goal is to reach your audience on an emotional level, you have to think carefully about the tools you have at your disposal and what those tools do beyond creating a frame. These choices have a psychology to them. And when combined together in unique ways, they have an impact that rises above individual merit. Ratcliff, T. 2017 ‘What is character perspective?’ On: Vimeo At: https://vimeo.com/219223876 (Accessed on 29 October 2018). I’ve been experimenting with widescreen format in my project and assignment films. ‘Widescreen cinema creates a different visual impact than 1.37 ratio. The screen becomes a band or strip, emphasizing horizontal compositions’ (Bordwell 2017 p.183). ‘By offering more image area, a widescreen format offers bigger challenges about guiding attention than does the 1.37 ratio.’ (Bordwell 2017, p.183). But how do you compose for wide screen? Bordwell suggests that while it is an obvious format for sweeping spectacles such as westerns, travelogues, musicals and historical epics, it raises questions about its use for ordinary dramatic conversations and more intimate encounters between characters. One common solution has been to fill the frame with a face. The wide screen format challenges directors to design more screen-filling compositions. ‘They can’t be as compact as the deep-focus compositions of the 1940s, but they can achieve pictorial force’ (Bordwell 2017, p.183). But wide screen compositions can build up significant depth, even in a confined space. Director’s multiply points of interest within the frame – requires care with staging and timing actors’ performances. ‘The advantage of Scope [the 2.35:1 ratio] over even the wide screen of Hatari! [shot in 1.85:1] is that it enables complex scenes to be covered even more naturally: detail can be integrated, and therefore perceived, in a still more realistic way. If I had to sum up its implications I would say that it gives a greater range for gradation of emphasis. . . The 1:1.33 screen is too much of an abstraction, compared with the way we normally see things, to admit easily the detail which can only be really effective if it is perceived qua casual detail’ (Quoted in Bordwell 2008). Bordwell(1985) argues, when using widescreen format ‘the good director will not flaunt the ratio itself…the composition should enhance the narrative situation. As for participatory freedom, the widescreen allows the viewer to notice nuances of character interaction by virtue of the director’s gradation of emphasis’ (p.18). Wide screen format creates a different visual impact than 1.37 ratio. Can contain multiple points of interest within the frame. Enables complex scenes to be covered more naturally – integrating detail in a more realistic way. Contains a greater range of gradation of emphasis – while the 1.37 screen is too abstract compared to the way we normally see things. The widescreen frame offers the viewer an experience in which they can see nuances of character interaction. Barr, C. (1963) ‘Cinemascope: Before and After’ Film Quarterly, 16, 4, pp.4-24. Bordwell, D. (1985) ‘Widescreen Aesthetics and Mise en Scene Criticism’ The Velvet Light Trap Review of Cinema No 21 At: http://www.davidbordwell.net/articles/Bordwell_Velvet%20Light%20Trap_no21_summer1985_118.pdf (Accessed on 19 October 2018). Bordwell, D. (2008) ‘Gradation of emphasis, starring Glenn Ford’ At: http://www.davidbordwell.net/2008/11/13/gradation_of_emphasis_starring_glenn_ford (Accessed on 19 October 2018). There are three ways you can build up tension in a scene – camerawork, pace, music. Films have two ways into your brain: eyes and ears. When you are watching a film, these two senses are interconnected. Sound affects what you see and from what perspective you see it. As soon as the audio starts, you should be placed within a perspective. The sound design picks specific sounds out to tell the story within the scene. In film, you see with your ears. The power of sound design is its invisibility behind the image. If dialogue sounds close, then the viewer is close to the person that is speaking, wherever they are. The Assassins arrive outside an apartment building to detonate a hidden bomb. The 4′ 50″ scene is without music and almost entirely without dialogue. How is the tension built within the scene? By building a bed of constant, noisy, city ambiance, and singling out and stringing together like beads on a wire, key noises that the tell the story. The background that Eric Bannagh and his team are going to assassinate a man in his home by getting him to answer a phone they have secretly installed a bomb in. The first moment of trouble in the scene comes in sound. Up until this point in the scene, isolated noises represent the steps of the plan going smoothly. The truck passing by represents a break in that chain and a hitch in the plan. At this point the ambience outside starts to take on some strange qualities. There’s a high pitched whine, like a train stopping, on top of everything. Just like the moving truck blocks the assassins view, the movers talking keeps them from hearing the daughter’s car returning back to the apartment. We hear her footsteps, not her voice this time, which continue indoors. In the apartment the ambience is quiet. The incredible thing about this scene is that Spielberg builds the tension, not by working towards a great crescendo of noise, but by gradually subtracting elements. While the daughter is in the apartment, the danger is signalled by a single sound effect, the rotary dial of the telephone. The climax to the scene is silence. It’s a silence that works so well because it anticipates the noise of an explosion to come. At this point, the ambience has become really impressionistic. When it comes back in, it has echo that reverbs the hurried footsteps and an anxious siren. The whole sound universe corresponds in a way to the assassins, to their feelings and their nerves. This scene is made with no dialogue, no music, just camera work and sound design. When making a film always ask myself ‘what do my ears see?’ Because sound affects what the viewer sees and the perception from which they see it, I should build scenes using camera work and pace, and a sound design that carefully picks out key sounds to tell the story. Feeling very much out of my depth with this project, I jumped straight in by recording a variety of short and long sounds for the soundscape. The idea of manipulating these sounds for the soundscape felt very alien to me. I couldn’t see how pulling and twisting them was going to produce a pleasing result. All the sounds were recorded using the SoundDevices 633 mixer/recorder with Rode NTG-1 shotgun microphone. Except for three stereo sounds, ‘traffic’, ‘wind in trees’ and ‘a breath’, one of which I planned on using for the background track. These stereo sound tracks were recorded using an iPhone6 with a Rode i-XY stereo microphone attachment (see post ‘Field recording with the Rode i-XY‘. Not all the sounds were used in the final soundscape. I have decided to purchase a twelve month subscription to Pro Tools, as I know I will continue to use the software for sound editing. Having not used Pro Tools before, I needed to get to grips with the basic functions. 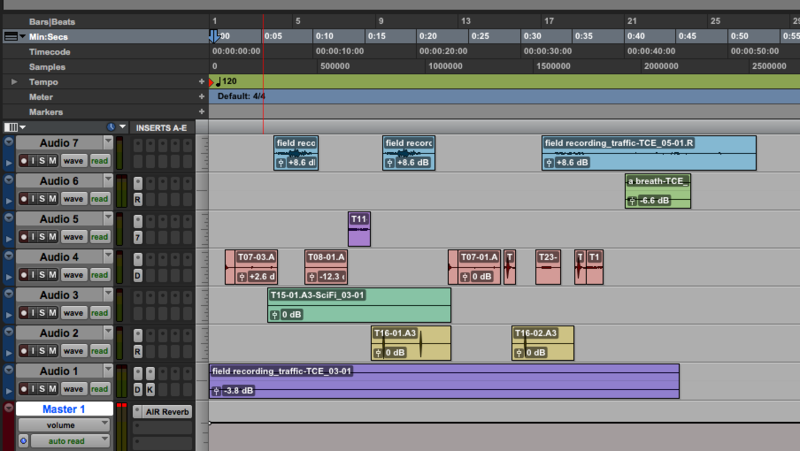 The layout and controls are very different to what I am used to when mixing sound in Media Composer. Again, I feel a little out of my depth using Pro Tools. My first attempt at assembling the soundscape was very poor. It felt shallow and uneventful, nothing more than a simple, joined-up sequence of sound effects with Delay and EQ. Something was missing, but I didn’t know what. So I began experimenting with the placement and juxtaposition of the sounds. Each sound was ‘treated’ with an EQ to remove high or low frequencies and a Delay for reverb effect. Pro Tools comes with a wide range of plugins for this. A range of factory presets within each plugin provides great creative flexibility when applying Delay and EQ to sounds. Through trial and error, I was able to create some unusual, but effective sounds. The turning point in my investigation came when I realised I could create a ‘sound space’ – by first laying down one of the long stereo sounds for atmosphere, allowing it to run for the full length of the soundscape and applying the techniques suggested in the project brief (slowing it down to half speed; adding reverb and reducing the volume so it sat in the background) and then adding other sounds on top. So the whole thing would work together as one cohesive piece. I also discovered I could blend two or three short sounds together, end to end for effect, or overlay two sounds to create a new one with a greater depth of character. It was only through trial and error like this, that I made any progress with the project. As I was creating a soundscape with no corresponding picture, I realised I needed to treat this as a sound composition. Letting the sounds bounce off each other. Creating a sense of movement through the juxtaposition, blending and pace of sounds. Treated with a range of different EQ and Delay settings. Finally, I applied a little reverb to all the sounds by adding the Reverb plugin to the Master Fader, and using the ‘Medium sized room’ preset. This has helped to gel them together and sound like they are all in the same acoustic space. The finished Soundscape was output as an MP3 audio file. It’s amazing to think this soundscape has been made out of a handful of very ordinary sounds.